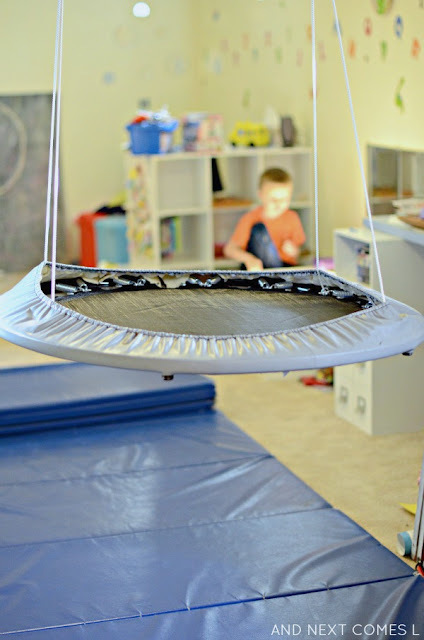 Back in the spring or early summer, I bought my boys an amazing round platform swing from Costco.ca. It was shipped to my door within a week for less than $50. It is a great swing to use both indoors and out and the price was awesome. However, that swing pops up so rarely on Costco. And any other platform swing that I've come across has been around $100 US or more. Platform swings are certainly not cheap. Well, shortly after we got the platform swing, I came up with an idea for making a DIY platform swing. This idea has been floating around in my mind for a few months now. It was only recently that I actually decided to try it out though. I think it took me less than ten minutes to put this DIY platform swing together, so it's easy. Really easy. And it's certainly a fraction of the cost compared to the $100+ swings. And if you already have swing hooks installed, then you will require zero tools, other than a pair of scissors, for this project. 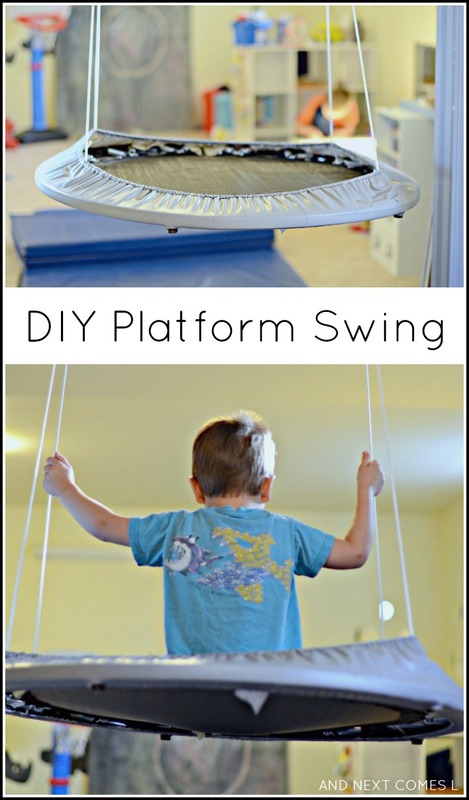 The inspiration for this DIY platform swing is this DIY bungee swing. The secret material is a mini trampoline. 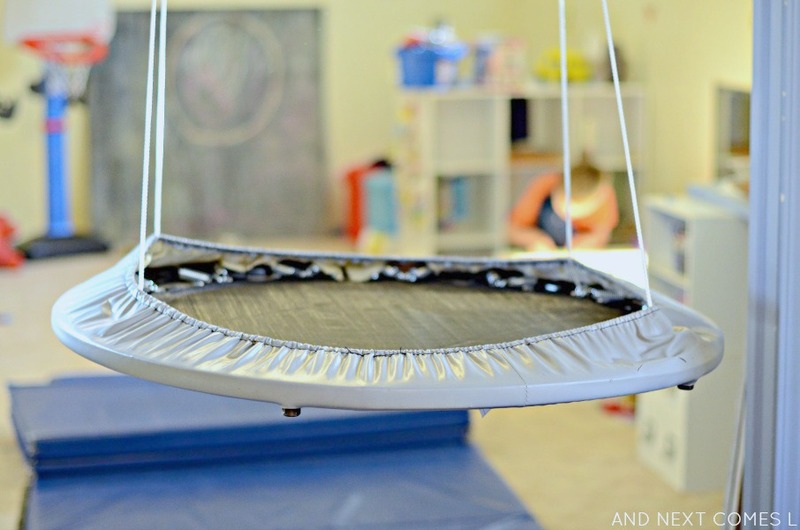 A mini trampoline already has a padded cushion around the frame. It also already has a strong frame that can support a lot of weight. The legs can be easily removed from the mini trampoline. It is really the perfect base for a DIY platform swing. 1/4" nylon diamond braid rope - The amount you need will depend on how low to the ground you want your swing to be. I used the leftover rope from when we made our homemade taco sensory swing. Tape - I used regular Scotch clear tape. 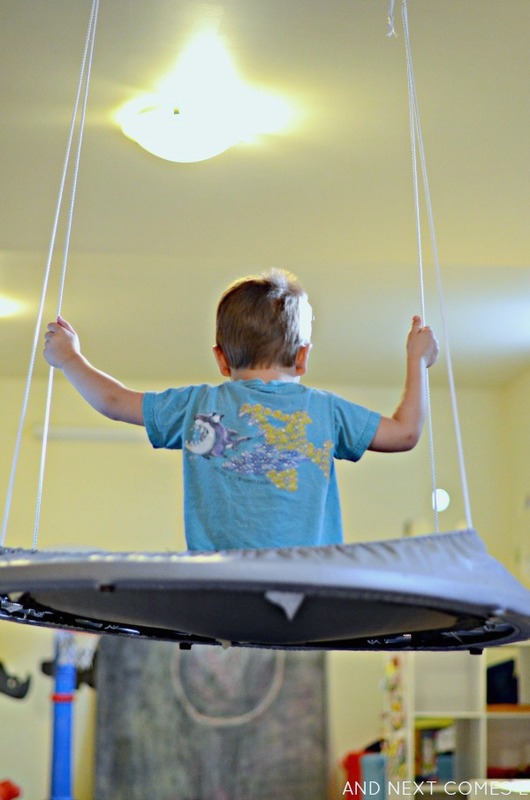 Always test homemade swings first before letting children play with them. Do not leave children unattended on swings. Put swings away when not in use. Make sure that the swing is in a clear, unobstructed space. I am not responsible for injuries or damage pertaining to or caused by this DIY swing. STEP 1: Remove the legs from the mini trampoline. STEP 2: Determine how low you want the swing to hang by measuring from the ceiling (where the swing will be mounted) to the approximate height off of the ground that you want. STEP 3: Cut the rope slightly longer than the measurement from step 2. Repeat until you have 4 pieces of rope. OR Double the measurement from step 2 and add an extra 12 inches or so. Cut 2 pieces of rope that length. There are two different ways to hang the swing. I went with two long ropes for our swing. STEP 4: Tie the ropes onto the mini trampoline either by tying each of the 4 ropes to the frame of the trampoline OR looping the rope around the frame on two ends and then tying the rope at the top to form a triangle. We went with the second method. Tip: You may want to look up how to tie non-slip knots to ensure that your knots are going to hold the weight of the swing and your child. STEP 5: Tie the other ends of the ropes to the carabiner hooks. Again, be sure to use a non-slip knot. Or, depending on how you cut the ropes, then you might want to loop the rope onto the carabiner hooks like we did in step 9 for the taco swing. Tip: If any ends of the rope get frayed after cutting, then wrap the ends with tape. STEP 6: Install swing hooks. You can see how ours are installed here. STEP 7: Test it out! Before I ever put my own children in a homemade swing, I always test the weight limit myself. If it can hold me while I swing, then it can easily hold my kids.